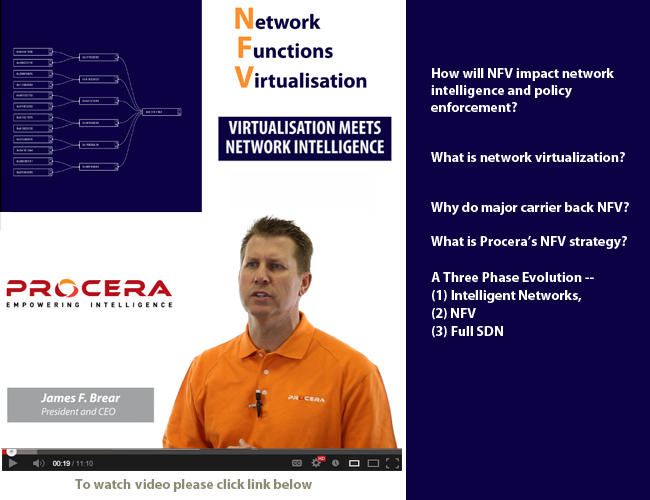 Procera Networks launched Virtualized PacketLogic solutions based on the European Telecommunications Standards Institute (ETSI) Network Functions Virtualization (NFV) initiative. The company's Virtualized PacketLogic solution for intelligent policy enforcement will be in a carrier-class, virtualized "appliance" package running on commodity hardware. The virtualized version will offer the same software functionality as the current hardware platform. Any hardware solution that can run standard-based virtualization software can be deployed with the PacketLogic solution modules (PSM, PRE, and PIC), including deployments that run all of the modules on a single hardware platform. Procera said NFV enables easier performance and scalability upgrades by simply adding more CPU and memory to the virtual machine. The Virtual PacketLogic solutions can be used for any portion of the lifecycle of a Policy Enforcement deployment from the initial functional evaluation, trial deployment, service rollout, bandwidth expansion, or geographic expansion, lowering the cost of acquisition of IPE technology as well as the operational cost. "The main promise of NFV is to benefit from commodity pricing of IT hardware, reduced power consumption and moving to a much faster service delivery method based on downloading software appliances as opposed to installing new hardware appliances," said Paul Veitch, chief network strategist at British Telecom. "Virtualization is a natural evolution of the PacketLogic architecture," said Alexander Havang, chief technology officer for Procera. "Procera has always maintained hardware independence, and has delivered the highest performing solutions available on the market using off-the-shelf hardware technology. We have used virtualization extensively internally, and our customers are asking to deploy this in their networks today. Speed to market with new services and the ability to deliver targeted niche services also becomes a much simpler and more rapid process." Procera's Virtual PacketLogic solutions will be available for trial in the third quarter of 2013, and are expected to be generally available by the end of 2013. How will network functions virtualisation (NVF) impact network intelligence and policy enforcement? AT&T and CSC have formed a global strategic alliance to develop next-generation technology solutions for enterprise businesses. Under the agreement, the two companies plan to develop and offer cloud solutions for businesses globally. The alliance combines CSC’s cloud services, specialized consulting and applications expertise with AT&T’s network and cloud infrastructure platform. CSC will deliver its BizCloud and other cloud services through AT&T’s global cloud infrastructure platform and networks. 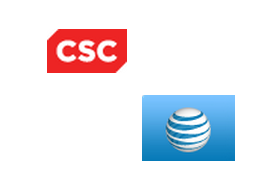 CSC will provide application expertise to AT&T and its customers. In addition, AT&T will assume management of CSC’s internal network and its managed network services portfolio with commercial clients, providing CSC and its clients with a global, highly-secure network capability and enabling development of next-generation network service offerings. The agreement will remain in place until 2020, with the option to extend. A new OpenPOWER Consortium – an open development alliance based on IBM's POWER microprocessor architecture - is being organized with the goal of building advanced server, networking, storage and GPU-acceleration technology aimed at next-generation, hyperscale and cloud data centers. Founding members include Google, IBM, Mellanox and Tyan (a Taiwanese supplier of motherboards). IBM said it will make its POWER hardware and software available to open development for the first time, as well as make POWER IP licensable to others, greatly expanding the ecosystem of innovators on the platform. The OpenPower Consortium will offer open-source POWER firmware, the software that controls basic chip functions. By doing this, IBM and the consortium can offer unprecedented customization in creating new styles of server hardware for a variety of computing workloads. "The founding members of the OpenPOWER Consortium represent the next generation in data-center innovation," said Steve Mills, senior vice president, and group executive, IBM Software & Systems. "Combining our talents and assets around the POWER architecture can greatly increase the rate of innovation throughout the industry. Developers now have access to an expanded and open set of server technologies for the first time. This type of 'collaborative development' model will change the way data center hardware is designed and deployed." Level 3 Communications was selected to provide a North American satellite gateway for O3b Networks, which is launching a global, next-generation satellite network for telecommunications operators, Internet service providers, and enterprise and government customers in emerging markets. The gateway will allow O3b to link its Gigabit IP network connectivity and bandwidth services to customers located in the U.S., Caribbean and Gulf of Mexico region. O3b, which is short for "Other Three Billion," will provide broadband connectivity everywhere on Earth within 45 degrees of latitude north and south of the Equator. The company focuses on emerging and insufficiently connected markets in Latin America, Africa, the Middle East, Asia and the Pacific. system that delivers the high quality connectivity enjoyed by major world capitals to the underserved and unconnected." 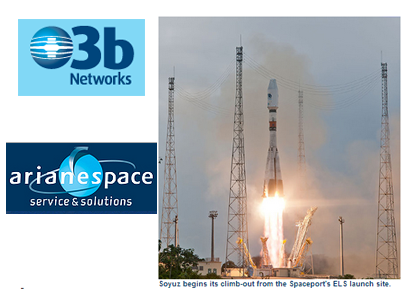 In June, 3b’s first four satellites were successfully launched by an Arianespace Soyuz rocket from the Guiana Space Center. 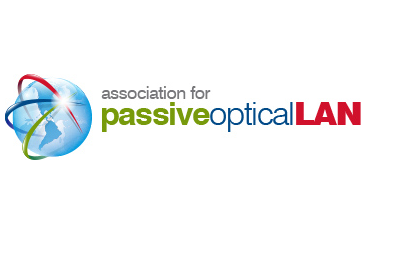 A new Association for Passive Optical LAN (APOLAN) has been formed to promote the global adoption of passive optical networks in the local area network. Founding members include Corning, IBM, SAIC, TE Connectivity, Tellabs, Zhone and 3M. The association said the next generation of Passive Optical LAN technologies will bring revolutionary change for the IT industry by providing the simplicity, scale and bandwidth to address current and future demand, while minimizing costly and disruptive cabling and equipment upgrades. Backers also point to substantial savings in capital and operational costs over traditional workgroup switch-based LAN architectures. "Participation in the APOLAN is open to all organizations interested in leveraging Passive Optical Networking to revolutionize the way local area networks are designed, deployed, and managed," said Dave Cunningham, president and chairman of the APOLAN. "The deployments of Passive Optical LAN to date have demonstrated significant cost and performance advantages compared to traditional Ethernet designs, and the optical foundation "future-proofs" the network for any new bandwidth demand – a clear advantage over existing copper solutions." Nasuni, a start-up based in Natick, Mass., announced a Cloud Mirroring capability that delivers data protection in the cloud. Nasuni provides a simple, unified storage service via on-premise hardware that looks and feels like a traditional storage controller, but gains the advantages of the cloud by incorporating cloud storage in much the same way that a traditional storage array uses commodity disk drives. With Cloud Mirroring, users' data resides in a primary cloud, while a copy of their data resides on a secondary cloud, and the entire process is managed by the Nasuni service behind the scenes. Nasuni's unique management of the entire cloud-based storage enables synchronization of customer data between clouds without any additional data management work for the customer. Cloud Mirroring is delivered seamlessly to users, allowing them to focus on managing their data while Nasuni manages the back-end. "Customers have made it clear that there's no such thing as too much data protection when it comes to cloud storage," said Andres Rodriguez, CEO of Nasuni. "In true Nasuni fashion, we wanted to be the first to give the enterprise Cloud Mirroring functionality that's simple to use and adds no additional bandwidth demand. All of our customers are still covered by our SLA, but for those who want to go the extra mile to protect their data, only Nasuni offers Cloud Mirroring." 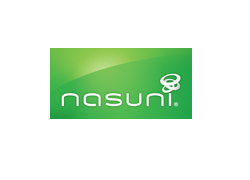 In October 2012, Nasuni raised $20 million in Series C funding for its enterprise cloud gateway. The funding came from a new key investor,.Previous investors Flybridge Capital Partners, North Bridge Venture Partners and Sigma Partners also participated in the financing. Nasuni is headed by Andres Rodriguez, who previously was founder and CTO of Archivas, which developed an enterprise-class cloud storage system and was acquired by Hitachi Data Systems in 2006. Earlier, he was CTO of the New York Times, where he drove digital strategy at NYTimes and Boston.com. Emerson agreed to sell a 51 percent stake in its embedded computing and power business to Platinum Equity for $300 million in cash. Emerson will retain a 49 percent noncontrolling interest in the business, which will operate as an independent company. Share repurchase will be increased by $600 million to offset associated earnings dilution. Emerson’s embedded computing and power business, which is based in Carlsbad, California, had 2012 revenue of approximately $1.4 billion. It supplies embedded computing solutions based on open standards such as ATCA, AdvancedMC, CompactPCI, COM Express, OpenVPX and VMEbus. The Northwest Open Access Network (NoaNet) has deployed ADVA Optical Networking's 100G Core technology throughout Washington state. The deployment, which was partly supported by stimulus funding from the Broadband Technology Opportunities Program to provide services to unserved and underserved communities, reaches many rural areas of the state. Cyan reported Q2 revenue of $31.7 million for the second quarter of 2013, up 37% year-over-year from $23.1 million in the second quarter of 2012, and up 20 percent from $26.3 million for the previous quarter. Net loss for the quarter was $9.1 million, or $0.33 per share, compared to a net loss of $1.5 million, or $0.59 per share, in the same period last year and a net loss of $9.4 million, or $3.61 per share, for the first quarter of 2013. The company noted 85 new deployments for its Blue Planet SDN platform. "For the second quarter, Cyan delivered record revenue and gross margin while continuing to make investments to capitalize on our large and growing addressable market," said Mark Floyd, Cyan's chairman and chief executive officer. "Our Blue Planet software-defined network (SDN) platform is a key differentiator and continued to gain momentum, with over 85 customers implementing this innovative technology since its launch last December. We continued to make significant strides in our international expansion, increasing our presence to 13 countries outside of North America and increasing our international partnership base. During the second quarter, we successfully completed our IPO and ended the quarter with over $92 million in cash and cash equivalents."